Weber Downs hosted eight trials on Saturday for the $54,100 Golden Spike Futurity. OGDEN, UT—APRIL 14, 2019—In her first career start Pitchforks Panther was a game three-quarter length winner over Valentina Relentless to set the fastest qualifying time for the $54,100 Golden Spike Futurity at Weber Downs. 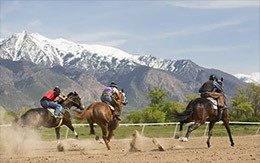 The 10 fastest qualifiers, from eight trial races contested on Saturday, will return to the Ogden, Utah racetrack on Saturday, April 27th to vie for the winner's share of the purse going 300 yards. Ridden by jockey Carlos Guillen Chacon, Pitchforks Panther completed the 300 yards in :15.822 seconds, an 89 speed index, to get the top qualifying mark. Trainer Roberto Treto saddled the son of multiple stakes sire DOMINYUN for owner Victor Ortiz. The Painted Pitchfork bred the sorrel gelding in Colorado from the Panther Mountain mare Special Lady Panther. Vf Silverback, an Oklahoma-bred son of multiple stakes sire IVORY JAMES was a 1-½ length winning in the second trial to get the 9th fastest qualifying time of :15.969 seconds. Trainer Jay Pitcher conditions the gray colt for owners Kelly and Kyle Cook. Bred by Victory Farms, from the Mr Jess Perry mare Perrys Folly, Vf Silverback is a $16,500 Heritage Place September Yearling Sale graduate. For the complete list of Golden Spike Futurity qualifiers CLICK HERE.